Leave your comments below, if you like. The final of Australia’s domestic first class competition is being played at the Gabba, with Queensland hosting Victoria. According to the competition rules, the host side only has to draw. A couple of seasons ago, Victoria hosted the final and to ensure that they got the draw, they batted for ages to run up 710. Against Queensland. Now that the boot is on the other foot, Queensland are taking a brutal revenge. A short time ago, Queensland were 4 for 880. Ouch! I really need to plan this better, but because I post these things in advance (it’s Friday and I’m about to go out), I have nothing to add. I do like beer though, and have just had some rather nice cheddar. Rock on, cricket fans. Originally uploaded by Flickr user foobear. Usually the two sports go hand in hand together, but not in this case. What on earth are they doing? All very amusing anyway. Originally uploaded by Flickr user RaeA. RaeA has some really fine photos from the Queensland v Victoria Pura Cup Final which is currently in progress. 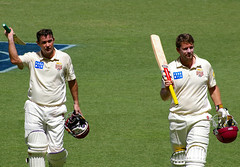 Pictured are Jimmy Maher (223) and Martin Love (169) who powered Queensland to 584 on the third day at The Gabba. Originally uploaded by Flickr user [Rohit]. Rightly or wrongly, Australia of 2005 are nothing compared to the 1999 model. The old model had bite, power and uncompromising aggression. The new model seems a bit lost; their warhorses and spearheads are, to be blunt, blunter than they once were. Watch the video and see if you’re as surprised as I am at their slick, machine-like qualities. As a sidenote, what a knock by Lara! Brett Lee has just sliced through the South African lower order to engineer a collapse. South Africa lost 5 for 12, to be all out for 267. Australia’s lead is over 100, and it is GAME ON as far as Ponting’s boys are concerned. There’s nothing in cricket quite like a rampant Australian fast bowler tearing through the opposition. Except, perhaps, a rampant Australian leg-spinner tearing through the opposition! The stoush between Nel and Lee was exciting as it was brief. Top stuff! Yes it kills you. Yep, it’s bloody expensive and lulls you into a fall sense of unbridled satisfaction. It smells, it lingers, it stains. But it’s our/their/your right. Pity Scotland and her happy smokers, for today marks the beginning of the end. I know it’s wrong. In fact, me and a mate were accosted by an elderly drunked in the pub the on Friday who had, after 50 years of puffing, finally given up. Well done that man. I usually resent the preaching of recently-quit smokers, but his insistence was too pressing. Much of his ramblings were incomprehensible, no doubt fuelled by another equally wonderful poison, but he did make one useful observation: smoking is the biggest con around. It is. And we’re all the more pathetic for it. However ridiculous as it sounds – and I tell my brother this on an almost weekly basis – we enjoy it! As I lit up another one, and supped on my beer in a remarkably cheap pub which does beer for Â£2.80, it got me thinking. 2006 will be the year I quit – it will – but nevertheless, I despise the nanny state and dictatorship we live in. Maybe the government are covering their arses for the eventual influx of law suits (“no one told me it would kill me!”) from society’s gluttonous creatures. Nevertheless, it makes me angry that someone in government can tell us – law-abiding, polite, hard-working tax-payers – not to smoke. Oh, and by the way, the bars housed on the Thames in Parliament are exempt from the upcoming ban on smoking; those very same minions will happily puff on their cigarettes while the rest of us suffer in the stupifaction of better health and a nicotineless existence. Apologies, shan’t rant about non-cricket matters here again. 3rd day at Durban. Rock on like the rockers you are.